When you’re in the middle of a busy job and client expectations are high, you can’t let a breakdown on one of your machines slow your productivity. That’s why it’s so important to have fast, reliable delivery of quality parts for your Cat® landscaping equipment. In eastern North Carolina, Gregory Poole is your exclusive Cat dealer. We carry the company’s complete line of mini excavators, backhoes and other landscaping equipment, as well as a large selection of genuine replacement parts to keep you running your best for years to come. 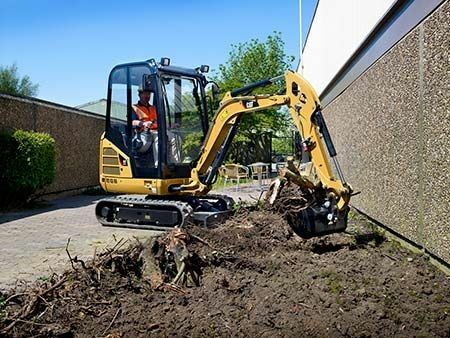 Your choice of Cat landscaping equipment is a smart investment in the future of your fleet and your business. Ensure your purchase keeps working at its full capacity by choosing genuine OEM parts for any repair or maintenance issue. OEM Cat parts deliver the performance and reliability you expect from the legendary manufacturer. As a result, they can help you maintain optimal uptime and lower you operating costs, no matter what a job throws at you. Parts.Cat.com is your exclusive portal for all Cat parts. Log on anytime to view up-to-the-minute prices and availability, and place your order. For busy landscapers who can’t afford to take unnecessary time out of their workday, Parts.Cat.com is a vital ally. Order online and, in almost all cases, Gregory Poole can fulfill your purchase the following business day. Register today or contact your sales representative for more information. Order Cat OEM parts from Gregory Poole, and we can have your purchase delivered to you — or to one of our convenient drop boxes — within 24 hours 97.5% of the time. Our expert technicians are available to discuss the details of any repair or maintenance issue and help you put together a package containing everything you need. When it comes to keeping your Cat and allied machines running their best, contact eastern North Carolina’s landscaping equipment experts first. Call or email Gregory Poole to place your order today.